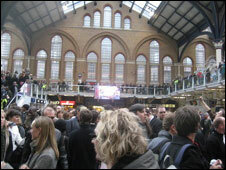 Fans of pop star Rick Astley descended on London's Liverpool Street train station for a "flashmob" event. 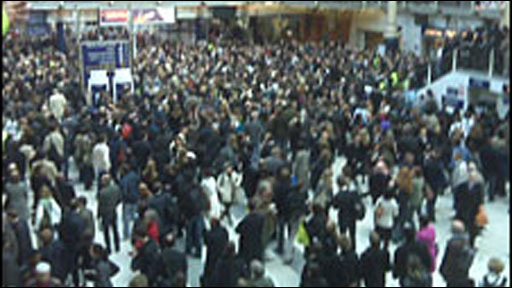 The "flashmob" - where a group of people assemble in a public place for a brief period of time - happened just before 1800 BST. Some of the fans donned Astley masks in honour of the 1980s hitmaker, before the crowd sang his trademark hit Never Gonna Give You Up. Police said the incident passed peacefully - if not quietly. Witness Paras Barot, 22, from Golders Green in north London, said he heard about the event on social networking site Facebook and decided to head to the station. "I got there with some friends just before 6pm, and there were lots of people there - the whole station was at a standstill." He said he thought there were some 300 or 400 people taking part in the event. "There was a countdown from 5.59 to 6pm. Some guys put their masks on, and a lot of them started singing the song. "For those of us who knew what was going on it was really funny." Mr Barot said he did not join in the singing. "I don't know the words." A British Transport Police spokeswoman said: "We monitored the incident. There were no problems, no arrests. They did what they had to do and then left." An estimated 13 million internet users have been tricked into watching the video for Rick Astley's Never Gonna Give You Up in recent weeks. As soon as I found out, I knew it was something I couldn't miss! I rushed from Canary Wharf where I work and it was most definitely worth it - 500 people sharing a common goal to entertain the nation - what can be better?